The Big Wobble: Monster category 4 cyclone Debbie hits Queensland coast leaving thousands fleeing: Storm winds of up to 250km/h (155 mph). Monster category 4 cyclone Debbie hits Queensland coast leaving thousands fleeing: Storm winds of up to 250km/h (155 mph). Severe Tropical Cyclone Debbie (category 4) is located to the north northeast of Mackay. 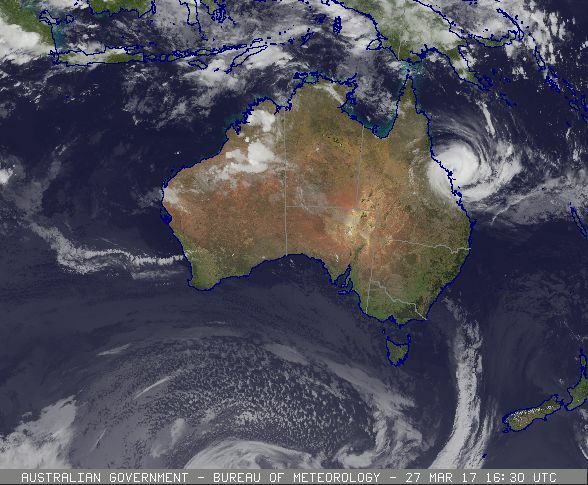 The rotation and the eye of this system can be clearly seen in the impressive and extensive mass of cloud over the Coral Sea, which is also affecting parts of the east coast of Queensland. Northeast Australia is bracing itself for the arrival of a "monster" cyclone expected to bring waves of up to 8m (26ft) to the Queensland coast. Cyclone Debbie, which has been upgraded to a Category four storm, is carrying winds of up to 250km/h (155 mph). Thousands of people have already been evacuated and Prime Minister Malcolm Turnbull has urged residents to act immediately. Queensland Premier Annastacia Palaszczuk said the emergency evacuation order was "probably the largest ever" for the northeastern state, and warned people to charge their phones as structural damage and power outages were likely. "This is going to be a monster of a cyclone," Ms Palaszczuk said, adding that it would rival the devastating Cyclone Yasi in 2011. About 10,000 people are believed to have already left their homes in the town of Mackay, and thousands more have evacuated their properties in low lying areas such as Bowen and Ayr, reports the BBC. About 25,000 residents of Mackay have this afternoon been asked to leave ahead of predicted tidal surges, with fears low-lying areas will be inundated. There are also fears parts of Bowen could be wiped. Meteorologist Bruce Gunn said the “very destructive” core of the cyclone is expected to be about 100km wide. He said the exact location and impact of the cyclone would become more precise as the system approached the coast.